Today I am given the task of writing about something I am terrible at doing. But anyone who knows me well will trust I’m not going to try to do this unless I found a role model to glean from. I’ve always taught, in order to learn a life skill, you have to study the successes of someone who has mastered the objective. For this lesson, our role model will be nature itself. Follow along with me. Here’s our new challenge to master: To learn how to simply do nothing in and of our own strength, while waiting for an intensely important area of life to return again. This subject came to light while out for what felt like an early spring walk last week. Actually, it’s still officially winter, but this particular day was unusually warm for early February. 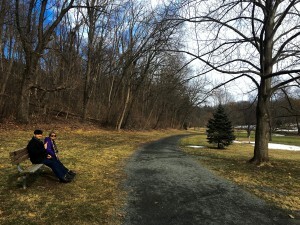 My wife, son and I took advantage of the thaw and went for an afternoon walk in an Allentown park. (Thank you, Josh!) About mid-way through, we came across the following scene. 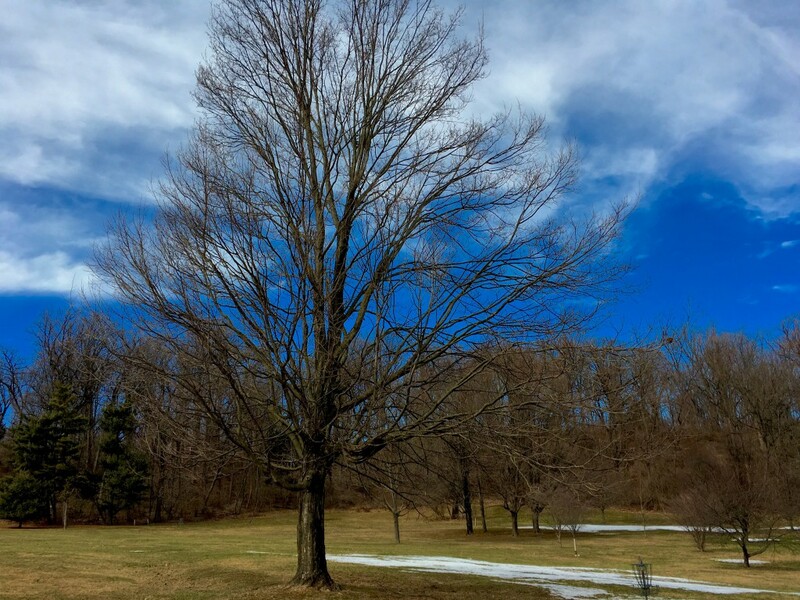 There was this shimmering blue sky, contrasted by bright green grass popping out from under the dull remnants of melting snow. Then, in a clearing, this massive tree with no buds or obvious signs of life was standing bold and strong, arms reaching up to heaven, doing absolutely nothing except feeling the warmth of the day, seeing the world around itself waking up from Winter’s freeze, and knowing with full confidence that soon buds will pop out, then leaves, then full foliage, followed by an entire season of warm summer days. But today, it did nothing other than wait in stillness, in praise of it’s Creator. Go ahead… take a good long look and meditate on this picture. It’s not such an unfamiliar scene these days, but has much to teach us. When I think about the potential static energy found in this massive plant, possessing such power I will never know, and to see it just standing there, doing nothing to bring about what must seem to it so natural, so inevitable, expected and anticipated; yet offering no outward signs whatsoever of struggling to burst into life… I was humbled. This tree demonstrated perfect, complete and utter trust in God, that He alone would defrost the soil around it’s roots, flood it with water and nutrient filled dirt, blow gentle wind over it’s branches, and bring an occasional gail-force breeze to prune dead limbs so as not to zap life from healthy new shoots; day by day heating up the air, until one Spring morning, at a just the right moment, all the forces of nature would proclaim, “Now! It’s time! Bloom into life once again!” The moment was amazingly awe inspiring. These past few weeks I’ve really been struggling. Not so much with the physical issues I’m facing from cancer, but from the spiritual and mental lessons needed to be learned from my diagnosis. The core challenge I face is found in Psalm 46:10 where the writer says, “Be still and know that I am God.” It sounds so darn easy in those eight little words that could be translated like this, “Sandy, do nothing right now but praise Me.”The tree in that park had mastered this concept, yet I squirm in my seat and use up every ounce of mind-power (Power? Really? Not much power found there to be honest!) trying to solve the vast complexities of biology and oncology to stay alive. Such an impossible task I’ve imposed on myself. These past months, I feel myself so dangerously close to that state, a pattern so opposite to the lessons learned from the tree in that park who is so vastly more aware of God’s peace and control in all circumstances. How desperately I need to once again “First seek the counsel of the Lord.” (1 Kings 22:5); to simply meditate, doing nothing other than lifting still arms in surrender and frozen patience, waiting for God, and not struggling to find the next “logical” step in my own thinking – which inevitably requires manipulating everyone around me to fall in line with my plans for their lives. (My poor oncologist must be so exasperated with me by now! Not to mention my wife and children.) Think about it. This methodology is really no fun for anyone at all. In contrast, June Hunt, in her study on facing terminal illness, writes so clearly and elegantly, “Territory is gained in the emotional battlefield of acceptance. When your heart is willing to trust in God’s love, you depend on His grace to live day by day. A new freedom emerges within … the freedom to live or die under the ‘shelter of His wings.’” (Hunt, J. (2008). Biblical Counseling Keys on Terminal Illness: How Can I Ever Let Go? (p. 7). Dallas, TX: Hope For The Heart.) How many of us long to dwell in that tranquil place of life right now? That place where we can truly let go and still trust it will all work out in the end. Some may suggest that God is aware that my days may be limited and He is therefore preparing me to pass on all my responsibilities to others. However, as I walk through this journey I continually find the opposite to be true. Whether we have months, years, or decades left, each moment is far better spent in quiet submission to God’s love and understanding of His good plans. The time for control and manipulation of our will must come to an end regardless of how long we have left to live. This is really the only way to fully experience peace, love, joy and fulfillment. And when we reach the day when it finally IS time to pass from this life to the next, we’ll be able to look back on years gone by with a deep sense of awe and satisfaction, and confidently be ready for that which comes next. I hope we are all able to seek out and enjoy those moments of being a big, tall, strong, still tree… doing nothing at all to change our circumstances, other than simply trusting God, and waiting for life to return again. This entry was posted in Life Lessons, On Terminal Illness. Bookmark the permalink. And I do believe we are usually better off NOT knowing why there was the traffic jam anyhow… Agreed. Trust God instead to work it all out! Day, you are always in my prayers for your bravery, faith and strength all these years. You inspire me! I love your comments… and often miss our childhood days living on, in and around the ocean! Enjoy those moments for us both when you’re out on the boat. I found your reference at Psalm 118:24. I also previously had highlighted verses 17-18 in the same Psalm which reads, “I shall not die, but live, and declare the works of the Lord. The Lord chastened me severely, but He has not given me over to death.” This always reminds me that we usually do pull through life’s challenges just fine, and even if we do pass, we really don’t have anything to worry about as He’s given us eternity to look forward to! One of the most difficult things to face yesterday afternoon was joining in on a cancer care support call again from my insurance company. They reported that two of the participants in our conference calls had passed away last month, and two more were seriously ill now. Only one member of the group has now survived longer than 18 months…. and she’s one of those who’s struggling. It sort of brought the statistics into reality, so waking up to your note today was comforting. Thank you! I promise to stand tall and confident, and trust God with each day He gives us. Love you! I’m wondering if all the energy (usually negative) we generate trying to make our body, friends, situations, etc. do what we want them to do simply drains us on a cellular level to not enable the body to heal on some level. Is it possible that if we just breath, settle our minds, relax our body, and succumb to God that I am Yours and You are mine do with me what You wish will bring a peace that will allow us to enjoy each day and not elbow our way through each day?